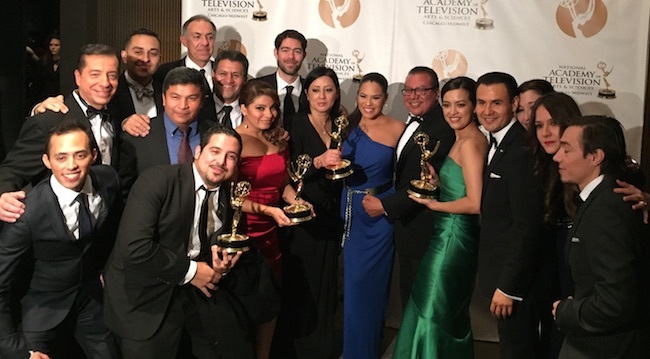 The Univision Chicago news team celebrates their Emmy wins. WGBO-66 Univision Chicago has a lot to celebrate after securing one of the top awards of the evening during the 56th Chicago/Midwest Emmy Awards ceremony held Saturday night. For the first time in its history, the station won the Emmy for Outstanding Achievement for News Programming-Evening Newscast. WGBO scored a record 17 Emmy nominations, winning in 5 categories. Teri Arvesu, María de Lourdes García, Executive Producers; Sonia Arciniega, Assignment Desk Manager; Luz Cubillos, Areli Padilla, Producers; Angélica Atondo, Anchor; Ericka Pino, Weather Anchor; Jazmín Beltrán, Mariano Gielis, Enrique Rodríguez, Reporters; Stevan Petkovich, Director. Erika Maldonado, Reporter; Sonia Arciniega, Producer. Jaime Elizalde, Iván J. García, Fabián Ramírez, Diego Guirado, Michael Bania, Producers. *11/3 – Updated to include WMAQ’s win in the same category. Wrong station it is false info. The best news is NBC and they win every news, weather, sports, and everything in between category. As you see the information is NOT false. Univision Chicago did win. Perhaps your PR departments should take a lesson from Univision. Very true which is why ABC7 and Univision are partners. WLS is a true market leader. Watch out for the multiple emmy winning director at Univision, Stevan Petkovich,he is one of the rising stars in local television newscasts. You know. Just when I thought he couldn’t win any more emmys, Stevan Petkovich does it again. He is a superstar I tell you. A real class act. A standup guy. Congrats guys!